With appetizers, soups, meat and vegetarian courses, desserts, and more, this cookbook is essential for anyone who wants to feed the mind and body. The author clearly discusses the vitamins and nutrients in these recipes with practical explanations of their benefits. 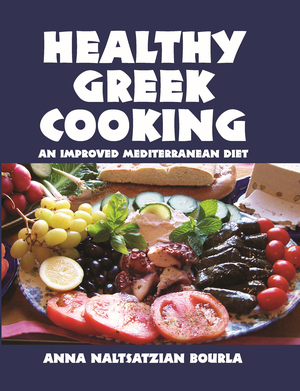 Information on Greek cheeses, olive oil, herbs and spices, and the storage and serving of wine is also included. Enjoy dishes, including rich, flaky spanakopitakia, savory moussakas, and honey-sweet baklava, at home and with friends. Kali orexi! The daughter of a painter and a chef, Anna Naltsatzian Bourla is an artist who has worked as an actress, restorer, and homemaker. Raised on the island of Corfu, she lived in New York City for more than forty years. Naltsatzian Bourla was diagnosed with breast cancer in 2006 and moved back to Greece to recover her health and pursue her artistic passions. She lives in Athens.